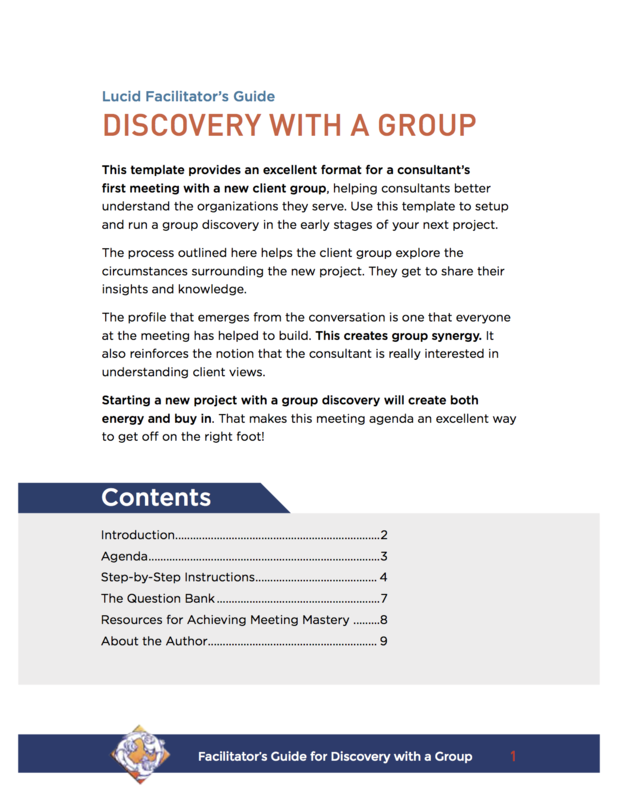 This meeting agenda template provides an excellent format for a consultant’s first meeting with a new client group, helping consultants better understand the organizations they serve. The process outlined here helps the client group explore the circumstances surrounding the new project. They get to share their insights and knowledge. The profile that emerges from the conversation is one that everyone at the meeting has helped to build. This creates group synergy. It also reinforces the notion that the consultant is really interested in understanding client views. Starting a new project with a group discovery will create both energy and buy in. Use this template to setup and run a group discovery in the early stages of your next project. To engage key stakeholders in a discovery conversation to build a picture of the organization’s history and culture. Ask questions and record key points. Decide how to communicate information from the meeting. A free meeting agenda template for making a decision to which all explicitly consent. MS Word and online formats. Includes a 25-page detailed instruction guide.